The Alienware Aurora R7 delivers the same great upgradability as previous models, with powerful new Intel 8th-Gen processors. There’s a reason the Alienware Aurora has long been our favorite gaming desktop — it’s powerful and attractive, and most importantly, it can be upgraded without the need for tools or much technical know-how. 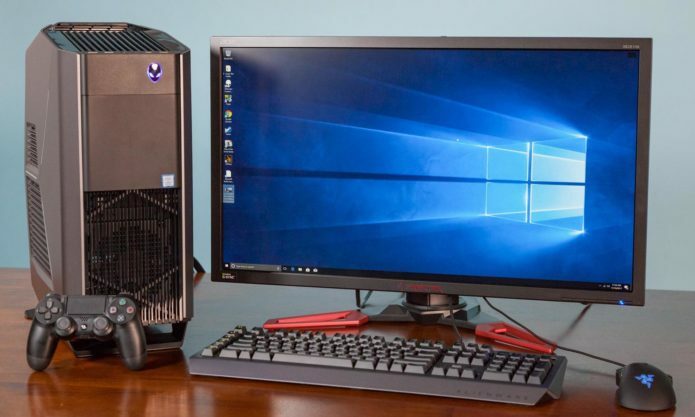 It makes sense, then, that not much has changed for this year’s Aurora R7 model ($799 starting, $2,524 as reviewed), which adds Intel’s powerful 8th Gen processors and a handy USB-C port to the desktop’s already excellent design. If you’re looking for a future-proof gaming PC that can be configured to handle 4K and VR, the Aurora is still at the top of its class. Alienware’s futuristic-looking Aurora is still one of the most attractive desktops you can buy, sporting the sleek gray panels and three-way LED lights that have become a staple of just about every Alienware machine. With its vented middle panels and ergonomic angles, the Aurora looks like the result of someone cutting a smaller chunk out of Alienware’s beastly Area 51 tower. The 18.6 x 14.2 x 8.35-inch, 32-pound Aurora is pretty hefty, though a convenient carry handle up top makes the computer easy to lug around. It’s not quite as compact as Dell’s XPS Tower (15.22 x 14 x 7 inches), but it’s a bit sleeker than other midsize competitors, such as the MSI Infinite (19.2 x 17.7 x 8.3 inches) and Digital Storm Vanquish (20 x 17 x 8 inches). Of course, it wouldn’t be an Alienware product without customizable lighting. Using the PC’s Alienware Command Center app, you can have the desktop’s left panel, right panel and front-facing power button glow a myriad of different colors, either by choosing from one of several presets or by picking your own colors for each zone. The Aurora’s lighting is pretty subtle by gaming-desktop standards, but I enjoyed being able to swap out the desktop’s default blue hues for some soothing purples and pinks. I also appreciated how the Command Center app instantly recognized my Alienware Gaming Keyboard, and made it easy for me to match up the peripheral’s lighting with that of my desktop. The new Aurora’s port layout is largely unchanged, save for one important addition: a USB-C port right up front. This brings the Aurora up to par with machines such as the Dell XPS Tower and MSI Infinite, and makes it easy to quickly charge up or connect any of your USB-C gadgets. Other than that, you’ve got your usual array of three USB 3.1 ports and headphone and mic jacks in the front. The back of the Aurora is loaded with more USB connections than you’ll probably ever need, including six USB 2.0 ports, four USB 3.1 ports and an additional USB-C port. You’ll also find a full suite of audio ports, an S/PDIF jack for optical audio gadgets and an Ethernet port. The system’s Nvidia GTX 1080 Ti graphics card sports its usual HDMI port and trio of DisplayPort connections, giving you plenty of options for connecting your monitors. As with previous iterations, the Aurora’s key feature is upgradability. The desktop’s side panel pops off with a quick pull of a lever, and once you’re inside, you can slide out the power supply and remove the graphics card, storage drives and RAM, all without using a single tool. The panel release lever on our review unit was screwed in to keep the machine safe during shipping, but once that screw was removed, I could enjoy the same tool-free tinkering that makes the Aurora (as well as its XPS Tower cousin) such a painlessly upgradable system. Sporting an Nvidia GTX 1080 Ti graphics card alongside Intel’s new 8th-Gen Core i7-8700K processor, our Aurora handled every game we threw at it with aplomb. When playing the Injustice 2 PC beta on Alienware’s machine with all settings turned up, I noticed every little detail, from the stitchings of Robin’s suit to the intricate purple patterns that adorn Brainiac’s ship. Better yet, the Aurora consistently ran the game’s benchmark at 59 frames per second, even at 4K with graphics maxed out. The Aurora made an excellent showpiece for the graphically rich Rise of the Tomb Raider, rendering the game’s gorgeous environments at 85.8 frames per second at 1080p with all settings maxed out. That’s just behind our Origin Chronos (95.4 fps, GTX 1080 Ti), while topping our Corsair One (72 fps, GTX 1080) and our 54-fps desktop average. When we bumped the game to 4K with all settings cranked up, the Aurora turned in 28 fps, which is just barely below our 30-fps playability threshold. When moving to the slightly less demanding action of Hitman (1080p, max settings), we got a silky 97.2 fps. The Aurora fell to the Chronos (127.6 fps) and Corsair One (129 fps) while once again topping our 86-fps category average. Unsurprisingly, the Aurora’s powerful guts maxed out the SteamVR Performance Test with a score of 11, making the Alienware machine more than ready for high-fidelity virtual reality. That score ties results from the Chronos and One, and tops our 10.1 average. The Aurora scored 6,763 on the 3DMark Fire Strike Ultra test, which gauges 4K performance. That’s on par with the Chronos’ mark (6,705) and better than the One’s result (5,032), as well as our 4,656 average. Thanks to its 8th-Gen Core i7-8700K and 32GB of RAM, our Aurora proved to be as beastly at everyday multitasking as it was at gaming. The system never slowed when I piled on activities, even as I bounced among six Twitch streams, opened over a dozen browser tabs, ran a full-system scan and downloaded a game on Steam. The PC netted a 24,196 on the Geekbench 4 performance test, topping the Origin Chronos (21,585; AMD Ryzen 7-1800X), the Corsair One (17,755; Core i7-7700K) and our 18.641 gaming-PC average. To put the benefits of Intel’s 8th-Gen processors in perspective, our 6th-gen Aurora (Core i7-6700K) scored 16,398 on Geekbench 3 last year. The Aurora’s 512GB SSD transferred roughly 5GB of data in a speedy 13 seconds, for a transfer rate of 382.3 MBps. That’s not quite as fast as our Chronos’ 500GB SSD (828.3 MBps) or our 428.6-MBps average, but it outpaces the Corsair One’s 480GB SSD (236.6 MBps). Aside from letting you light the Aurora up in all kinds of cool colors, the Alienware Command Center app offers a healthy number of tools for monitoring and customizing your system. The app’s AlienFusion tab gives you a detailed look at your machine’s power consumption, while the Thermal Controls section lets you monitor and adjust the desktop’s heat output. The app also lets you set up handy Game Modes, which allow you to program a set of actions to occur (such as firing up Fraps and Discord) every time you launch a game. The Aurora starts at $799, which gets you an Intel Core i5-8400 processor, 8GB of RAM, a 1TB hard drive and an AMD Radeon RX 560. Stepping up to the $1,099 model gets you VR ready, with a GTX 1060 graphics card and 16GB of RAM, while the highest-end, $1,649 config features a Core i7-8700 processor, a 256GB SSD with a 2TB hard drive, and a GTX 1080 for maxing out the latest and greatest titles. You can customize these models at the point of purchase, adding extras including up to two GTX 1080 Ti graphics cards ($950 extra), up to 64GB of RAM ($600 extra) and as many as two 1TB SSDs ($650). Our custom $2,524 configuration gives a good idea of what tricking out the Aurora looks like, as this model sports a Core i7-8700K CPU, a GTX 1080 Ti GPU, 32GB of RAM and a 512GB SSD with a 2TB hard drive. The Alienware Aurora is still the best overall blend of design, power and upgradability you can get for the money. Its slick chassis and customizable LED lighting will make it stand out in your command center, and its painlessly easy-to-upgrade internals make it future proof for even the most technically averse gamers. And with support for Intel’s 8th Gen Core processors and Nvidia’s GTX 1080 Ti graphics cards, it’s a legitimate 4K and VR beast. If you want the same easy upgradability within a more subtle design, Dell’s XPS Tower Special Edition($1,149 starting) is an excellent alternative. If you want something more compact without sacrificing too much expandability, the Origin Chronos ($1,200 starting) is worth considering. But if you’re looking for an attractive, LED-backlit tower that you can expand over time, the Aurora hits that sweet spot like few machines can.